The two hour and thirty minute running time is long and there were definitely scenes that could have been made shorter or cut out all together. However, Straight Outta Compton definitely is worth seeing, even if you can’t relate to rap music. The streets of Compton were a hard place to grow up in the 1980s. Guns, gangs, drugs and violence were prevalent, and a young black man was lucky just to stay alive, let alone not go to jail. However, the Compton of the 80's also produced some of the best innovators of rap music in the industry. Straight Outta Compton is the story of rap group N.W.A. and rappers Eric "Eazy-E" Wright (Jason Mitchell;Contraband), Andre "Dr. Dre" Young (Corey Hawkins; Non-Stop) and O'Shea "Ice Cube" Jackson (O'Shea Jackson Jr.). Living in Compton wasn't easy I'm sure it still isn't. The police profiling happened on a daily basis and the brutality went unpunished. Gangs ruled the street. All Dr. Dre wanted to do was make music to pay his bills and arguably, he had the talent. Ice Cube had the words to speak to a whole generation and Eazy-E had the funds to finance their first record. Eventually, N.W.A. got a record deal and went on tour with the help of Jerry Heller (Paul Giamatti; San Andreas). With more money and fame, came the inevitable clichéd problems. Known for their police bashing music, N.W.A. flirted with the authorities as the group slowly imploded. When Dre and Cube eventually left over compensation disputes, Eazy-E found his "golden ticket" was gone, as both men went on to successful solo careers. The cast, while fairly inexperienced, are excellent and the casting director did a fantastic job finding actors to embody the essence and physical characteristics of the real life individuals. O'Shea Jackson, Jr. portrays his real life father , Ice Cube, beautifully and Hawkins plays Dre with a vulnerability and intelligence making him all to human in a place where humanity seems all but gone. I was not the intended audience for this film, and there are certain aspects of it I didn't enjoy, but, overall, I thought it was great. The portrayals are fantastic, the music, while not my usual taste, was actually pretty good. The humanity behind the story is gritty, real and heartbreaking. The amount of cursing was annoying, albeit a reality for those individuals. The two hour and thirty minute running time is long and there were definitely scenes that could have been made shorter or cut out all together. However, it definitely is worth seeing, even if you can't relate to, or typically dislike, rap music. 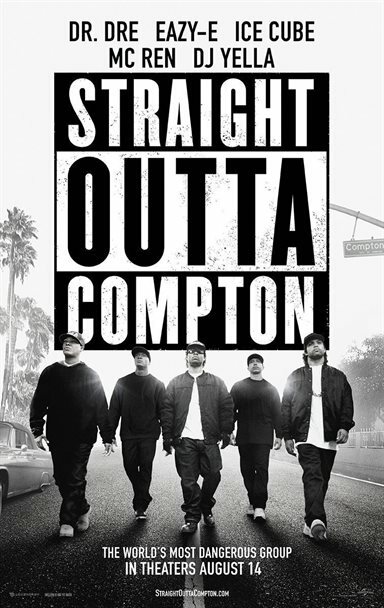 Download Straight Outta Compton from the iTunes Store in Digial HD. For more information about Straight Outta Compton visit the FlickDirect Movie Database.